In recent decades, most urban areas have dramatically developed and led to the migration of people from over populated city centers to low-density and rural lands, called urban sprawl. During this process, various facilities and houses have rapidly constructed in these regions. However, starting a new construction project without land evaluation would cause severe consequences such as degradation, erosion, and many other hazards that we are reluctant to experience. Therefore, setting appropriate management principles and defining land-use rules have become an urgent issue. Thus, the idea of suitability analysis is emerged, which its core concept is to determine the best place or site for a specific project. Now, it has frequently applied in land management, city planning, urban development, agriculture, etc. With suitability analysis, authorities can formulate instructive rules, and contractors can hence decide a safe and environmentally sustainable site for construction. To conduct suitability analysis, the method of assessment should be selected first. In this article, we reference the Environmental Impact Assessment (EIA), an advanced and popular risk evaluation methodology for the complex land-use development and environmental protection. 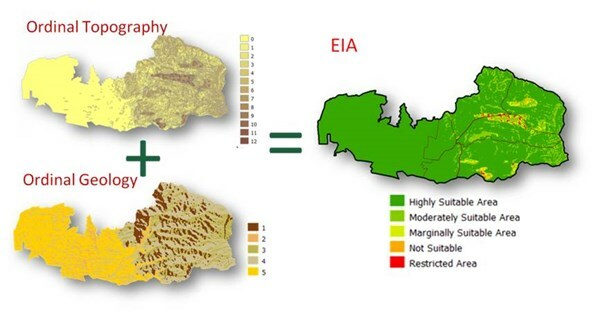 In order to develop an EIA model, several spatial data should be prepared, such as slope, topography, soil depth, and slope type. First, an Ordinal Topography map should be generated to evaluate the overall geomorphologic characteristic by combining slope and topographic data. And then, an Ordinal Geology map should also be derived from the soil depth and slope type. Finally, we overlay these two maps and summed up the values to finish the whole process of EIA. In this article, we demonstrated some results with a golf course site selection case in Taichung City, Taiwan. As shown in the figure above, the green color represents high suitability, and the red color indicates the contrary. In the example of golf course, that means the developer must select the green area and avoid the red area. This result can also be visualized more realistically through SuperGIS Globe. Therefore, planners and stakeholders can understand the suitability index across this area as shown in the figure below. Also, for sharing the result with the others, the administrator can create an ultra website and provide map services by SuperGIS Server. By using an interactive and easy-to-access online map, all people who have interests can easily find the information they need. And of course, this outcome can be utilized in the spatial decision and identify suitable sites for the new construction project. Picking a suitable land for safety and low environmental impact before construction are keys for sustaining facilities and environment. Suitability analysis plays an important role. It includes processing digital terrain data (DTM) and overlaying the data for calculating suitability index so that contractors or planners can select the most suitable site. In this scenario, users have integrated different kinds of SuperGIS products, including SuperGIS Desktop, SuperGIS Globe, and SuperGIS Server. With SuperGIS Desktop, the complex data processing and calculation become intuitive. SuperGIS Globe and SuperGIS Server provide multiple ways for visualization and utilization, offering stakeholders to understand outcomes in different aspects. The complete GIS solution provided by SuperGIS products lights an easy way to accomplish GIS tasks and make GIS friendlier at the same time.